Two weeks ago, I had a free evening in Cleveland during a business trip. Coming to Cleveland after a huge bender in NYC (including Scott’s Pizza Tour), I continued the heavy eating with a trip to Hyde Park Prime Steakhouse (part of the conference) and Wonton Gourmet earlier in the day. So, while I needed dinner, I decided to go someplace light. 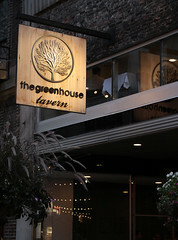 Greenhouse Tavern has been on my list for a while, so I decided that a burger at Greenhouse was just what I needed. 1. I gave the staff one of my photography business cards (the ones that say “Professional Bacon Photographer”, with one of my, well, bacon photos on it). 2. Channel 3 was there filming a piece on Cleveland restaurants becoming foodie destinations, and there I am with the Big Honkin’ Camera[tm], taking pictures of my food. This resulted in the unusual situation of the TV guys taking photos of me taking photos of my food. An unusual experience for me (although I didn’t end up making the news segment…). I started off ordering a beef tartare and a simple burger. However, once he found out I was taking pictures of my food and was a bacon photographer, the chef/owner, Jonathon Sawyer, really outdid himself, bringing out several extra dishes for me to photograph. So while I started off searching for a light dinner, I ended up with several courses of deliciousness. 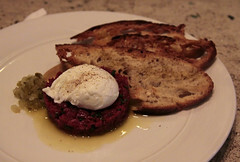 My first course, the beef tartare, was served with a cold perfectly poached egg, spring onion, and some cornichon relish. This was a great start to the meal, being a perfectly done tartare (on par with my other favorite tartare: The Wolseley in London), focusing nicely on the beef without a lot of unnecessary additives. The sides were all perfect. I’d get this any day, and probably will get it again next time. 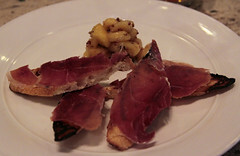 Next, the chef declared that a bacon lover like myself obviously needed some country ham to photograph, and brought out some of it. This was a really good ham, with nice earthy notes, and not overly salty either. It was nicely paired with a pear, mustard, and chili flake compote. 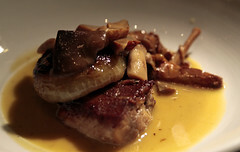 Next, the kitchen brought out a pork shoulder, which was coupled with a nicely-seared cippollini onion, mushrooms, and a homemade vinegar sauce made from Belgian beer. I’d order this any day, this was really hitting on all cylinders, even if it was weird to have the TV crew from Channel 3 filming me as I was eating and photograohing this. In general, food photography is always a bit difficult due to the lighting, but for this one dish, the guy from the TV station was shining the klieg lights at me. Finally, we got to the actual item I had come for, my Ohio Beef Burger. 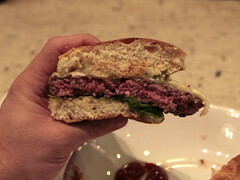 This was a perfectly cooked burger with some nice raclette cheese and cornichon relish. Nothing fancy, but an extremely well-executed burger, with a good sear on the outside of the patty, and a nice, juicy uniform pink throughout. Flavorful, juicy, and just the right amount of crisp. If I was a bit hungrier, I would’ve done the same as the folks down the counter and ordered the off-the-menu Shaq Burger, which also had pickled green tomato, garlic aioli, mozzarella cheese curd, and some other stuff I didn’t write down. Looked seriously good. But my basic Ohio Beef Burger was damn fine as well. So thanks, Jonathon. I hope to be back soon (well, as soon as an NH engineer can… although I do visit Cleveland for work pretty often). Cleveland is definitely on the repeat visit list.